You’re heading up the coast to Beagles Harbor on June 21st for the weekend. See the Chart Section below. From the tide charts, you know that Beagle sound follows a semi-diurnal tidal flow. (1) What is the water depth at point Z at 0800, 1015, 1230? (2) What is the water depth over the sand bar at 1600? (3) The Skipper would like to enter Beagles Harbor. What is the earliest time in the afternoon the Skipper could cross the sandbar to the harbor given that the Skipper would like some safety depth under the keel? The rule of twelves’ is not a bad approximation to sinusoidal curve and most normal tides follow a sinusoidal curve. The rule of twelves’ is not 100 % but usually close enough. If a tide is a semi-diurnal tide curve, it means the tide changes twice in 1 day or two high tides or two low tides in one day. This means about 6 hours between a high and a low. The rule of twelves’ means that over each hour between a high and a low, the tide height changes by multiples of twelves in the following manner. It is important to work the numbers to the closest high or low because the tide change is never exactly 3 hours. For example, if the high was noon but the low was 6:30 then you would do the following. Notice that if you interpolate properly then the tide is really at 1/2 way between 3 pm and 3:30 pm. So at 3 pm it is really a little higher than 1/2 and at 3:30 it is really a little lower than half. Your best estimate is half the range at 3:15 pm. Then interpolate for any in-between times. Confusing the difference between datum, tide height, and water depth. Datum: The listed depth on the chart which is the average of the lower low high tides. 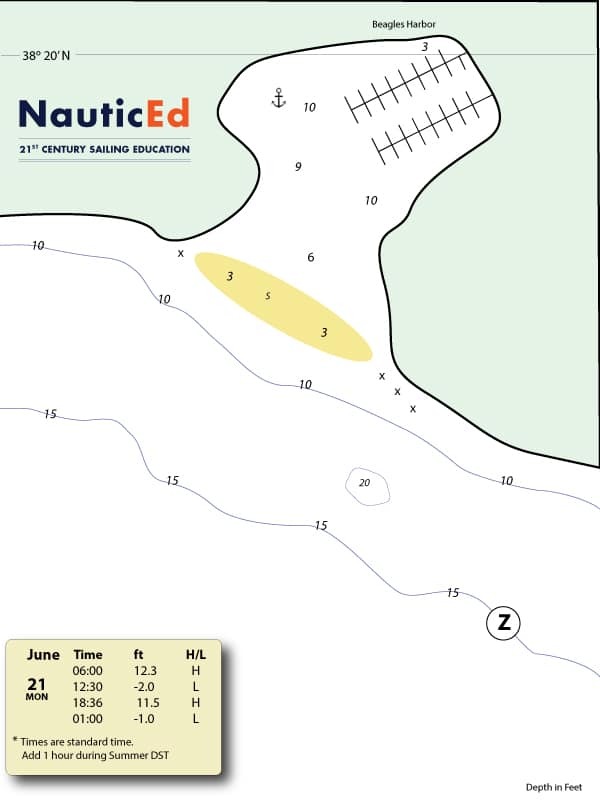 Water depth: The datum depth list on the chart plus the tide height at a specific time. Interpolation comes in when you want to find the depth at a time between times listed on the table. For example, what is the water depth at 1630 above? This is 1/2 way between 11 ft and 9 ft = 10 ft. The answers are in this attached PDF. DO NOT cheat and download now. Give the above a real proper go first. If you create the tables as above you will get the answers simply and be able to understand practical applications of tides well using the rule of twelves’. Before jumping in too fast, there is one tiny detail you need to think about before diving in too fast as well. Hint what is the latitude?